Highlights Electrical can handle all of your lighting maintenance and improvement needs. We provide turnkey lighting solutions to businesses all over Houston, and can even help with hard-to-reach lighting maintenance. Thermal testing, occupancy inspections, and generator maintenance are just a few of services offered by Highlights Electrical, your Houston electrical contracting company. Give us a call today at 713-266-6464 for all your electrical service needs. Energy-saving, cost efficient LED lighting is perfect for your home or business. As a leading Houston electrical contracting company, Highlights Electrical can help you learn about the advantages to switching to LED lighting. Call today to get started! 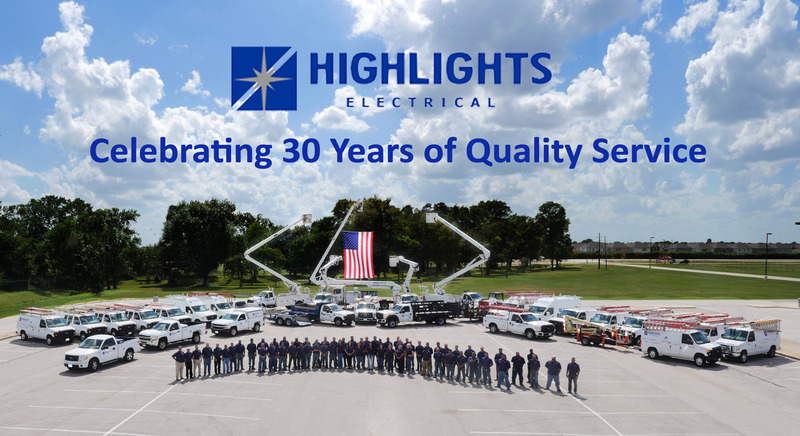 Highlights Electrical maintains a staff of licensed Electricians and has been proudly serving the Houston area since 1986. Give us a call at 713-266-6464 for all of your commercial lighting and electrical construction needs today! Currently, our sales force and office staff promotes and facilitates our electrical services, contracts, construction and manufacturing based out of Houston, Texas. Highlights Electrical maintains a top quality customer care focus. Our expert lighting services staff is always happy to take your call for information or to schedule any needed Houston electrical contracting service right away.